recruitment 2019. 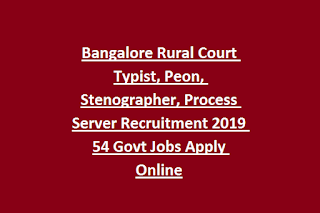 Last date to apply online for this Bangalore Rural Court Stenographer, peon jobs recruitment 2019 is 15-03-2019. Candidates selection is based on typing test or skill test or written exam and document verification wherever applicable. Candidates will be shortlisted on basis of Skill Test marks and /or interview marks or written exam marks. Exam date or skill test date or interview dates will be displayed in Bangalore Rural District Court official website of https://districts.ecourts.gov.in/bengalururural-onlinerecruitment. 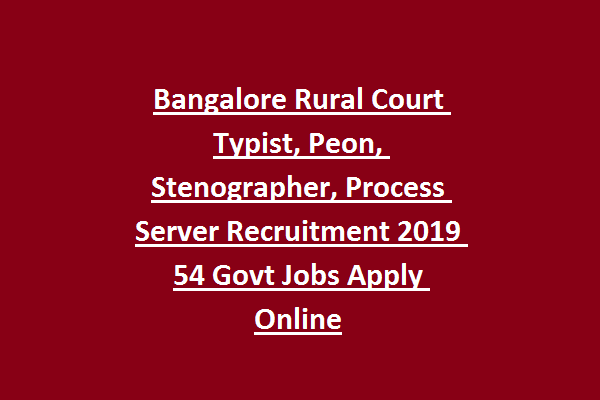 Apply online for this Typist, Peon Stenographer posts through Bangalore Rural District Court official website. Qualification, post wise pay scale, post wise online application form link and other details about this Bangalore Rural Court Typist, Stenographer jobs recruitment is updated below. There are total 113 posts are in this Bangalore Rural District Court, recruitment 2019. Upper age limit for General candidates is is 35 years. For general candidates, Cat 2 and Cat 3 candidates application fee is Rs.200/- and for others Rs.100/-. Candidates selection will be based on written exam and/or Skill Tests followed by documents verification. Candidates have to apply online for this Bangalore Rural District Court recruitment on or before 11-02-2019. Official website to apply online is https://districts.ecourts.gov.in/bengalururural-onlinerecruitment.